A patient’s history is a critical component to a physician for determining the etiology of a patient's problem. That’s why a history of present illness (HPI) is required in some form for every Evaluation and Management service. However, the HPI portion of the medical record is one of the hardest areas of E/M auditing to get a consensus on because the words in the medical record are subject to interpretation. And the last thing you want is for Barbara to interpret a patient’s medical records wildly different from how Tom or Mary interpreted it. 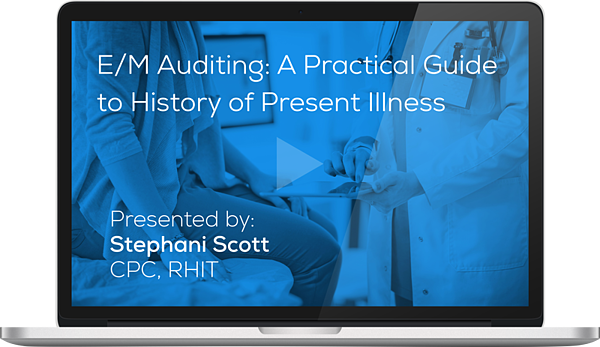 The subjectivity can seriously hinder your ability to conduct accurate audits. PLEASE NOTE: This program meets AAPC guidelines for 1.0 CEU. Can be split between Core A and all specialties with the exception of CIRCC. You will receive your CEU in a separate email after watching the presentation. On-Demand viewing requires successful completion of the post-test for continuing education units.